Our range of products include blind aluminum rivets. We are one of the leading manufacturer, supplier, exporter, wholesaler and retailer of Blind Aluminum Rivets in the market. The produced item is developed by machines of advanced technologies and is manufactured under the supervision of skilled labors. The company provides a product with simple installation and avoids all surface marring. The item is very light weighted and is easily portable. 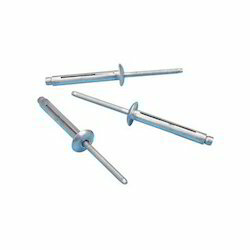 Blind Rivets are available on very reasonable and affordable price. 3/32" 1/4" 3/32" x 1/4"
3/32" 5/16" 3/32" x 5/16"
1/8" 3/16" 1/8" x 3/16"
1/8" 1" 1/8" x 1"
5/32"" 1/4" 5/32"" x 1/4"
5/32" 5/16" 5/32" x 5/16"
3/16" 1/4" 3/16" x 1/4"
3/16" 5/16" 3/16" x 5/16"
1/4" 1/2" 1/4" x 1/2"
1/4" 5/8" 1/4" x 5/8"